Mueller is under fire from investors. 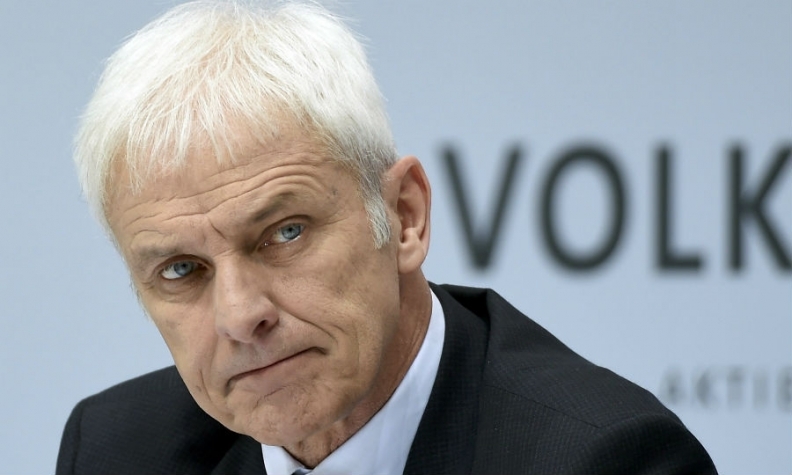 BERLIN -- German prosecutors confirmed they have launched a formal investigation of Volkswagen Group CEO Matthias Mueller and VW Group Chairman Hans Dieter Poetsch on grounds of suspected market manipulation. The prosecutor's office in Stuttgart said on Wednesday it is investigating Mueller for his role as board member of Porsche Automobil Holding SE and Poetsch, who is currently Porsche SE chief executive, on suspicion they may have informed investors too late about risks to the Porsche holding firm from VW Group's diesel emissions scandal. Porsche SE said the allegations were unfounded, adding it had complied with disclosure rules. The inquiry is similar to one launched by prosecutors last year in Brunswick, near VW's Wolfsburg headquarters, into current and former VW board members over whether they delayed the release of information about the cheating of diesel emissions tests. Porsche SE, which is headquartered in Stuttgart, controls 52.2 percent of VW's voting shares. The Stuttgart prosecutor's office statement confirms a report earlier this month that the two executives faced an investigation over allegations of market manipulation. The probe could deepen VW's legal woes in connection with the diesel scandal. It also draws Mueller deeper into the investigations. Previously while dealing with VW's legal woes over the last 1 1/2 years, Mueller was able to claim that he was not personally caught up in investigations. Mueller was brought in late 2015 at the height of the diesel crisis to replace then-CEO Martin Winterkorn. The inquiry also targets Winterkorn. Prosecutors said the investigation was prompted by a complaint from markets regulator BaFin in the summer of 2016, the same time at which Brunswick prosecutors launched their probe into VW officials. Mueller is already under fire from investors after VW backed away from an original pledge to publish the full account of its internal investigation into the emissions cheating. VW has maintained it informed markets properly, saying that it couldn't have grasped the enormity of the case and that it would balloon into multi-billion crisis.